The holiday season is officially upon us. 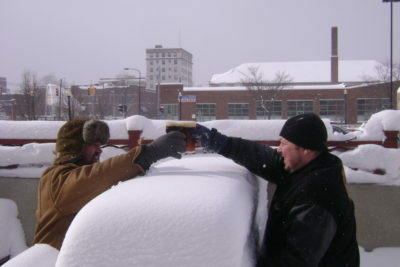 The decorations are up, the tree is lite, and the presents are bought… so it’s time to grab one of these Michigan Christmas beers and drink up as the snow comes down. The most flavorful craft beer in the world can be served right here in Michigan, and you better believe they didn’t forget about the holidays. There is a variety of Christmas themed brews produced right here in the Mitten, be sure to check out some of the holiday infused ones below. Figjam (10.75% ABV | 35 IBU). Nothing gets you in the holiday spirit quite like this Figjam Quadruple Belgian, with its warming alcohol, figgy undertones, dark dried fruit flavors of raison dates, hints of fresh baked bread, and a beautiful dry finish that leaves you wanting more. Christmas Ale (6.8% ABV | 28 IBU). Like trimming the tree, this beer should be part of every holiday tradition. Imported malts roll richly together to deliver a gift of raisin, caramel and honey flavors. A dash of spice brings forth almond and gingerbread aromas while leaving a clean, bright finish. Forget the cookies, leave this Christmas Ale out for Santa. Christmas Ale (5.5%). The basic inspiration for this brew was to create a sessionable holiday beer, using locally-grown malt, which would stand apart from the array of spiced winter warmers that are typically introduced this time of year. In contrast to many other seasonals, Christmas Ale doesn’t contain any spices: all of the dry, toasted notes and subtle toffee flavors come from the 100% Michigan-grown barley, custom malted by Briess Malting, while a blend of hops from Michigan and the Pacific Northwest lend earthy, herbal aromas. This seasonal stands as a smooth, highly drinkable beer intended to complement holiday menus, not overshadow them. 4 Elf Winter Warmer (8.75% ABV| 36 IBU). 4 Elf brew is the best way to ring in the holidays in liquid form. This spiced winter warmer is brewed with nutmeg, clove, allspice and other holiday flavors. This is an all-around food beer, everything from sweet treats to roast beef. Christmas Town Ale (6% ABV | 27 IBU’s). This brewer got a head start on Christmas when they daubed their Christmas Town Ale on November 1st. This is the perfect medium-bodied spiced ale that is made up of all things holiday cooking. You will be able to taste stubble hints of nutmeg, ginger, cinnamon, and clove. This is the perfect winter beer, and the holiday themed packaging will help put you in the spirit. Griffin Claw 3 Scrooges Winter Ale (6.5% ABV). This is a brew made of 3 flavorful taste, just like the 3 scrooges, it combines honey, orange peel, and spices. It’s a winter Ale the brings to life the winter season. Noel de Calabaza (9% ABV | 22 IBU). Deep mahogany and malty, layered hops and hints of fruit and spice like figs, raisins, sugar plums, cashews betwixt rum laden truffles make this the perfect accompaniment for all kinds of good cheer! Jubilance (7% ABV | 40 IBU). A collaborative brew made with locally-produced Press on Juice and local Crystal and Zeus hops. The specialty grains lend a candied sugar presence, while giving the beer a burgundy color that is sharpened by the color of the cranberry, orange, apple and ginger juices. The blend of barley, wheat and rye are complimented with ginger juice, while the fermented fructose from cranberry gives it a tart, boozy finish. Available exclusively in the Old Mission Peninsula-Traverse City tasting room. Solstice Stout (11.2% ABV). This is twist on a Simcoe Silly with a little bit of extra everything. Take tropical fruits, think mangos and pineapples, become apparent in this brew as it plays off the fruity Belgian yeast esters of fruit. This mixed together fills your mouth with juicy-fruit goodness. It has warm alcohol notes that lets flavors linger into eventful dryness that will keep you wanting more. Blitzen Festivus Ale (6.8% ABV | 55 IBU). The raisin, currant and berry notes are attributed to Bramling Cross hops, three types of crystal malts, cara and chocolate malt, which rounds out the flavors and aromas, with a hint of burnt sugar and chocolate. A combination of citrus peel and citrus pith flavors are accented by Hercules, Cascade and Pilgrim hops added throughout the boil. The subtle spiciness of Riwaka’s hops, combined with the crisp spiciness from rye malt, presents liberated flavors, reminiscent of savory holiday cakes. Big Jack Horner Style: Plum English Barleywine (11.2% ABV | 60 IBU). The richest and strongest of the English Ales, yet not as hop focused as the American versions. Historically English Barleywines were brewed for the winter or holiday season. A showcase of malty richness and complex, intense flavors balanced with higher levels of alcohol. This variation is brewed with fresh Michigan plums grown by the Meachum family at High Acres Fruit Farm in Hartford, which add a soft fruitiness to the background and help round out the flavor profile. Miracle Off 28th Street (9.2% ABV | 28 IBU). Miracle is a paradigm of the finest malts and complex hop blends to build the superlative winter ale for mature tastes. Brewed as an Olde Ale, exhibiting the seasoned character of the brew house staff. Enjoy Miracle with family and friends, in front of hearth and home. Juicy Tree (9.7% ABV | 65 IBU’s). Ever wonder what the piney outdoor Christmas time mixed with sweet fruit taste like? Well, have a sip of Juicy Tree and all your questions will be answered! This is an Indian Pale Ale that is created with blue spruce tips, juniper berries and cranberries. This brew has brought together the piney evergreens and sweet berries that will spark all your sense. First you’ll experience the tart and tangy fruit flavors quickly followed with a bitter pine finish. This brew is available both in stores and on the tap. ’tis the Saison – Cranberry Orange Holiday Saison (6% ABV | 29 IBU’s). Ever wonder what 120lbs of cranberries and 50lbs honey taste like mixed into a beer? Well tasting this brew has all those answers. ‘tis the Saison captivates your taste buds with bright, citrus and zesty notes of a cran-orange. Mix this with local Sleeping Bear Honey and it adds a stubble sweetness that brings forth the orange and helps play the cranberries in with hint of transness. To wrap it all together this brew ends with a dry/faintly sweet touch and lingering citrus on the palate. Christmastime (7.2% ABV). This is a dark and roasty oatmeal stout that is sure to bring all the holiday cheer to you. This brew is crafted with locally grown oats grown right in the U.P. It’s a limited addition so be sure to grab one to help you get through these long winter Michigan nights. ← Enjoy Michigan Black Ales for Black Friday!